In some English speaking countries, especially the old English colonies, this name is known, even if it is not that common. It is usually is traced to the town of Athol in Scotland, where the Duke of Athol still reigns and by a strange quirk in ancient English history is the only private person left who is allowed to have his own army! Many told us they don’t have their own tartan, instead using the Murray’s of Athol tartan. However, we now see their tartan in use – just like the small swatch here. 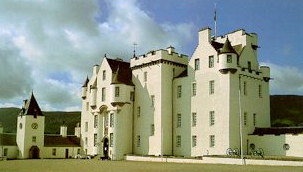 Unlike all the old brown castles of Europe, Blair Atholl castle is a predominantly white castle and is open to the public when you visit Scotland. In the U.S. the name is very rare, even though there are a number of small towns with that name. Most people can’t even pronounce it properly, because they don’t realize it is the proper noun from the same Greek word athos that means to perform or compete. In fact, the same root word as used in Athens, athletics or athlete. See also the name critic’s report on Athlon. Wikipedia claims the name is from Ireland: In Scottish Gaelic the name is Athall, which derives from the Old Irish Ath-fhotla, ‘another (or ‘new’) Ireland (Fotla being a traditional name for Ireland). Some sources claim a separate origin for the name Athol when used as a last name: (origin: Celtic and Gaelic. Local) A district of Perthshire, Scotland; from ath, a ford, and al, an old word for a rock, a stone,–Rockford, or the ford of the rock. The biggest town of Athol in the U.S. (and it is very small), is in upstate Massachusetts and is home to the renowned old Starrett Steel Works. They may be found online at www.athol.com. Athol Foden is a lifetime member of its Athol Historical Society. Athol Idaho is just a crossroads way up in the panhandle, and we are still looking for the other supposed four towns in the U.S. (We know one in somewhere in Kentucky). For literature and theater buffs the name is best known because of Athol Fugard, the South African playwright whose work did so much to help break down racial boundaries. He also appeared as an actor in the movie Ghandi playing the role of the great old General Smuts of South Africa. There is an Athol Books – a publisher – out of London and Ireland, with no connection to Athol Foden or Athol Fugard. The name is sometimes spelled in the older fashion of Atholl, like Atholl McBean who founded SRI (Stanford Research Institute) and the St. Francis yacht club in San Francisco. The feminine version is Athole, but this is very rare. Before you go to Scotland, visit www.blairatholl.org.uk.